Have you ever watched something you did several years ago and cringed at how bad it was? I had this experience recently. When the pilot episode of my show became available on Amazon Prime, I watched it with my family. Ug. That was hard to do. We didn’t know what we were doing. Production quality was subpar. I mean, I knew how to run a camera, but I’d never shot a dramatic scene. I’d read a book, so I knew to get coverage with a master, some over the shoulders and close ups. We had some decent (for the time) equipment, but not nearly enough lighting tools. I think we had about 3 lights, with varying color temps. We had a Sennheiser 816 shotgun, a really long microphone, and a couple of lav mics. Many times the shotgun was just too far away from the source, capturing quiet dialogue and loud room noise. I spent way too much time in post trying to fix it. And of course, it didn’t get fixed. And many of our actors were first timers. Or they had stage experience with no film experience. In post, I was in love with every line. I don’t think I cut any of them. There were so many ways it could have been better. But the end result was still a decent story that set up a 10 episode series. A series that won awards, not because it was amazing, but because there weren’t many people even trying to do anything like it back then. A series that dealt with real issues facing Christians today. Something, that even now-3 years later- is still being seen. 1, Everyone has room for improvement, and some successful filmmakers started out as bad as I was. 2, If you wait until you’re an expert to do anything, you’ll never do anything. You have to start where you are, and work to improve. It’s the 2nd point that’s the most important. How did a volunteer cast and crew spend under $9000 to produce an award winning 10 episode series that was shown on 4 different networks (JCTV, NRB, Parables, The Walk), tons of different local channels, satellite around the world, translated into another language in Romania, is still available on the internet and now a VOD streaming platform? We didn’t know we couldn’t. I know people who are smart, talented and have an amazing idea just waiting to be produced. And that idea just keeps waiting. But part of the point of independent film is the freedom to try to make your idea. You don’t have to wait for a big studio to come by. And if you are a filmmaker who has never made a film, then you’re caught in a Catch 22- You won’t make your film because you want it to be good, but no studio will help you make your film because you’ve never made a good one. For Christian TV producers, there is no hope (at this point) of ever getting the funding to make your episodic, dramatic show from one of the religious networks. Thats not how the model works. They exist because content creators (namely preaching/teaching/talk shows) buy time from them. They do not pay to have programs produced, and they normally do not pay for existing programs. There are exceptions, but generally this is the rule. So the chance of getting your grand episodic idea funded through a big Christians network is just about zero. You can get your show on the air for free, but even if they give you any money, it won’t be enough to cover the cost of production. If you want to see your idea become reality, you are going to have to do it. You’re at the bottom, and you have to start moving forward to move up in quality. That means starting with your script idea and writing it, even if it is horrible. And then keep writing and writing, and creating and creating. Read, learn, study. Get better. improve. Shoot short films. Do projects. Create, and try and keep trying. and keep improving. One day you’ll look back and go, wow, those first things I did were awful. But if you never did your terrible projects, you wouldn’t be able to do your better ones now. Everyone starts at the bottom of the quality ramp, and if you want to get better you have to keep moving forward. Since the first episodes started broadcasting in late 2012, I have wanted to see the show available on a major streaming service. Until recently the best (only?) route was to hire an aggregator to try to place your content in iTunes, Netflix, Hulu, Amazon, and anywhere else with a VOD distribution pipeline. Most of those were several hundred dollars up front, no promises. A few would try to place your content for a percentage of what you might make off views/sales. I’ve never tried to cash in on Peculiar. It wasn’t a huge financial success. Not only did I not have several hundred dollars to spend on this, I didn’t expect to make back any investment that large. But I do want this series to be available to as many people as possible. After my amicable split with my traditional distributor, I contacted one of the percentage based aggregators. He replied honestly, and not surprisingly, that he felt he could place my show on Amazon, but nowhere else. But I would need to rework the closed caption files. At that time, costs of captioning was a huge hurdle. I did find a way to get the content onto Amazon Video myself. But, the files would be Standard Definition, not HD. and I could not submit episodic content. I actually questioned an Amazon Create Space representative pretty hard about why this was the case. I never received a satisfactory answer. Any episode I uploaded to Amazon would be low resolution and would stand alone. The only way to get Amazon to group all of the episodes from your series together was to use an aggregator. So I tabled the idea. In May of 2016 Amazon announced it’s new service. Open “to any video creator, the e-commerce giant will compete head-to-head with Google’s YouTube for video-ad dollars and views as well as other big Internet video distributors like Facebook and Vimeo.” What that boils down to is a way for independent content creators to upload their video creations to Amazon and make them available through the streaming site. You can upload any short, feature, series, documentary… anything, and make it available to Amazon’s streaming audience. The company shares revenue for purchases and pays similar to Youtube for free Prime streaming. You could even set up a subscription service through AVD, but I don’t know much about that. Got Content? First, of course you need content that you have permission to, or own the rights to distribute in this manner. I don’t yet know how content ID is going to work, but you can bet that like Youtube, computers will be scanning this library to find copyright violations. Set up your account. You will need to add your bank and tax information before you can publish your content. Prep your content. AVD supports Pro Res 422, MPEG-2, and h.264 (in certain wrappers. h.264 in a QT .mov wrapper is not supported.). I uploaded my files in a Quicktime Pro Res 422 file. These files are huge. But they are also pretty much lossless, when compared to the MPEG2 or h.264 formats. Plus I had my series stored in this format. But upload speed is critical. Try to find a commercial connection you can use. It would take me days to upload just one file if I tried to do this at home. If you have 5.1 surround audio, then you will need to use either the MPEG 2 or h.264 file format. Upload. If you have a series, you don’t have to upload every file at the same time. You will need to have all the metadata filled in, cast and crew, graphics, etc… and then select the video files and captions, select the availability of the content. If you want to sell a season pass, you need at least 3 episodes uploaded. You can select when you want the content to be available, but I just chose as soon as possible. Publish. Once you think you have everything ready, hit Publish. If you forgot anything, you will have the chance to correct it. Then be prepared to wait. It takes Amazon a few days to look at your content and publish it. You will see small green circles for the areas the content will eventually be available. They should be half full and green. Once everything is approved and live, they will be all green. I published episodes over a period of time. My “circles” would still be half full, but episodes would already be available for viewing. Once every video file has been approved, then it will show completed. What if you want to change something? Then just go back into the dashboard of AVD, re upload the file, change the txt, etc… and hit save. Then wait several days again for the changes to take effect. Promote. Amazon has instructions on how to link to the streaming page for your content, and some “Watch on Amazon” graphics. And of course, you will want to let your existing audience know about this new outlet. So far over 350 minutes of content have been watched. That will pay me… less than $1.00. But that’s OK, I’m not trying to get rich on Amazon, I want people to see the projects I’ve been a part of. If you can navigate the tricky caption requirement, making your content available on Amazon Video open it up to a whole new, pretty large, audience. I speak English. I know a few words in other languages, but not enough to say I speak them. Recently we were in a series that highlighted several testimonies from people in our congregation that were living out the Gospel. One of those testimonies was from a Spanish language speaker. During the interview I had someone there to translate. He gave me a synopsis of the answers during the live interview, so I could follow up. Later I sent a video cut of just the answers to him. He typed out a complete manuscript for each answer. I made paper edits to that manuscript. This saved time, and helped create content that I used for subtitles later. Then he came into the edit bay and helped me make the actual cuts to the video. A few times he suggested slight changes which sounded better to his ears. Then I took the manuscript and broke down the text into titles for the English viewers. And he reviewed these for timing. It took a bit of extra work, but we were able to share a compelling testimony with our entire congregation, instead of just Spanish speakers. Many weekends I am I the director chair, calling cameras during the weekend services at my church. Other times I’m in the TD spot, punching buttons as another director calls the shots. I have to confess, I’m not sure what my direction always looks like. I know what I see in my mind. And I know if the members of the team executed the calls correctly. But I don’t always know what it looks like as it goes down. I hope it looks like what I imagined. As you call cameras, you have 3 things in mind all the time: the shot you were just on, the shot you’re on now, and the shot you’re going to next. And sometimes you even have a fallback shot in mind. As soon as a camera comes free, you are calling the next direction to that operator, while you are waiting for the timing to go to the next shot after the camera you are currently on. It’s a continuous flow of past, present, and future imagery. If you have a good crew, they can help you out by getting shots you like without much direction. But even the best operators can’t read your mind. Much of directing is communicating complex instructions quickly, clearly, and succinctly. Then there are the times that you get into the zone, and you know the song, and what your camera folks can do. And you can truly be immersed in the worship moment, as you are calling cameras. That’s when it’s fun! You have to find this place where you’re focused on executing the technical and artistic parts of the service and able to worship. That’s only possible if we are all doing our part. So, there’s about a million things going on. I’m not always conscious of what the shots actually look like, I’m always conscious of what I want them to look like. You cannot direct and micromanage at the same time. You have to turn loose and trust that the team will execute the orders you give. Sometimes you might see a camera op get into focus trouble, or go shaky, and you have to clear off that shot faster than you plan. So you know when things don’t go as planned. But it’s not until I watch the program back that I know exactly what it looks like. You must trust the team. It’s a creative process, and everyone involved has a part. if it looks good, it’s just as much the result of talented team members as it is competent direction. I used to work for a church that has been on the air with a traditional TV program for over 5 decades. In the Orlando metroplex, they reach about 100,000 viewers per week with their Christian program. It consists of a song or two from the service, and the message from the pastor. It is a fairly traditional church television program. When I was on staff a few years ago and had access to the data, I saw that we were reaching a predominately older crowd (75% of viewers were over age 55.) It was, and still is, a good work and it ministers to a lot of people in central Florida. And because of the nature of non profit educational license religious channels and networks, there will always be a need for preaching/teaching shows in Christian TV. But those shows will continue to reach older, religious audiences. And will continue to not reach younger ones. What if you took the money used to produce the program and buy airtime, and used it to produce programming that appeals to younger audiences? The churches I’ve worked for with TV programs spent between $30,000 and $250,000 on airtime purchases every year. Plus they had one or more staff people who were primarily focused on producing the content for the program every week. Conservatively estimating salary, taxes, insurance, etc… let’s say $50,000 annually. That’s quite a bit of money in the indie production world. What if you invested that money into creating video content that reflected a biblical world view, but wasn’t a traditional worship service/preaching program? What if it was something that told a story and, like a parable, taught truth at the same time? People who don’t watch traditional religious programming. More specifically, find a target demographic in a group pf potential audiences members that don’t already consume traditional religious programming. According to Pew Research, Older Americans watch more religious TV. Younger Americans are engaging in religious content online. Young audiences watch a lot of video content. 18-24 year olds still watch over 16 hours of TV per week, but that number is declining. The TV that they do watch is not traditional Christian TV programming. And they are increasingly watching video online. The older the demographic is, the more broadcast TV they watch. We don’t need shows that target the 65 year old Christian, we already have those. We need churches to develop programs targeted at younger audiences that do not already watch religious programming. The cost depends on what sort of show you are making. I’m most familiar with narrative programming. But you could do other sorts of shows that are not preaching/teaching/worship based. If you do narrative, obviously, your church probably won’t be paying scale for actors and crew. Most of the people involved will be doing it as a ministry project. But unless you have no money at all, you should try to pay people something. I’ve done a show for no money before. It can be done, but it’s not sustainable long-term. What if you could come up with $100 per day for the main cast and crew? That’s not scale, and there would be taxes taken out, etc… but $100. I have generally been able to shoot an episode in 4 days or less. If you have 4 main actors, and a crew with director, camera, audio and PA, you are looking at $800 per day. $3200 per episode. Plus any gear, additional actors, insurance, food, etc… $5000-5500 per episode. That may seem like a lot, but it is nothing compared to what network programming costs per episode. At $5500, a 6 episode run would cost $33,000. 13 episodes would cost $71,500. This is assuming someone on your church’s staff is writing and producing the program, filling in the show running duties. And someone on staff would be doing the post work as well. One person cannot do it all, so you will need some help. Filmmaking and TV production is a team sport. Bare bones, on a shoe-string, you could make 6-13 episodes of a show for less than the cost of air time and a staff position in many markets. Other kinds of show may cost more or less depending on what all is involved in creating them. You just spent your airtime budget on production. How is anyone going to see it? -Christian TV is begging for narrative content. Literally begging because they can’t/won’t pay for it, but also begging because they want it badly. It’s tempting to ignore broadcast television altogether. But even though the number is dropping, according to Accenture Digital Consumer survey, over half of TV shows and movies are still watched on TV. So it’s not a horrible place to be. And given the state of the religious TV market, you could have your show broadcast around the world for free. You might even get a little bit of money back to go toward the production of the program. One network my show was on was able to cover the cost of closed captioning. Traditional Christian programs have to purchase air time, but non traditional ones have a lot of effective, free options for broadcast. Putting a Christian TV show on a Christian network is not way to reach the masses. The vast majority of viewers are Christians. I know that isn’t surprising, but I want to be clear that a program on Christian TV will be mostly seen by Christians. That’s OK, discipleship is something the church should be doing, and this is an avenue to disciple believers beyond the walls of your building. You can produce programming that might appeal to non Christians, and broadcast it through non religious outlets, but it will cost more. Be sure to count the cost before you head down this road. There might be ways to mitigate those costs, but there will be costs. It’s also very big. You cannot just throw a video on Youtube and expect it to reach thousands of people. If you have a video that has been seen by over 100 people, then you are in the top 30% of all Youtube videos. 300 hours of content is uploaded every minute! Youtube is massive. It’s the 2nd largest search engine, behind Google. So, most content is not seen by a lot of people. In order to be effective online you must have a marketing strategy. You need to develop an audience. As a church you have a great foundation in your own congregation. Not only should you be mobilizing them to watch, but mobilize them to be encouraging their sphere of influence to watch as well. Last year my church did a campaign to get people to share their testimony through social media. It was not as successful as we had hoped. Still, I was able to locate over 80 videos that had been uploaded in the project, and I know that was just part of the ones uploaded over all. Those 80 videos had been seen over 200,000 times. Even if only a small portion of your congregation engages, you can still reach a lot of viewers. Does your church have a ministry to help parents teach their kids about the Bible at home? How about developing a program that targets young mothers, and touches on subjects that they will have to face as they teach their own kids? Do a lot of mission trips? Send a video crew out with your teams, and produce a program that highlights the importance and impact of being in involved in missions. Find something you are passionate about, that fits into the strategic vision of your church. Develop a program that targets younger audiences who would be interested in programming about that theme. Build a team, and make the show. Micro Syndication: Is this the Solution for Indie Christian TV? I have written about this before, but I wanted to talk about it again. Christian TV is upside down. Content creators buy time on educational licensed stations so they can then ask for money from viewers. I never paid for airtime with my show, Peculiar, but most of the time we didn’t get money either. Only one network gave us anything, and that was just to help with paying for closed captioning. In most cases on religious stations/networks the most you can hope for is free air time. Your program costs money to make, and you want to sell it to them. They can’t sell ads to cover the time, so they aren’t buying. There are a few networks that could afford to buy programming, but they don’t. That’s a problem for shows that don’t ask for donations, because it still costs money to make them. So what can you do with your program? Micro Syndication. This is an idea I want to try with my next series. It will be a lot of work, but I don’t see why this wouldn’t work. The goal is to buy time on a for-profit network locally, and sell advertising during your paid programming. I went as far as pricing the air time on this once before. There are stations that will let you do it. First you need a program. You’re going to have to have at least the pilot, and likely a few more episodes done before you can implement this. The program needs to be 22:30 with 6:00 of breaks. That’s room for twelve :30 spots. Your program must have space for advertisers, or it won’t work. And your program has to be something people want to see, or it won’t work for long. Second you need a media buying agency. You could do this yourself, but once you get beyond a couple markets, the relationships your agency has will serve you well, and they can find deals you will miss. They know when and where you can find time near shows that are similar to yours. And you want that. Third you need a sales agent to find sponsors for your program. They will get a percentage of each ad they sell, but they should be local to the station you’re trying to get on. Their first calls should be to people in the pages of any Christian Business Indexes for the area your trying to broadcast in. They aren’t just selling spots, their selling a vision. You’re delivering viewers during a program with content they want to support. In a target market have your media buyers shop for a good spot for your program. Find out what it will cost per week. See if they can work in some ads to promote your program. Once you know how much your program will cost per week, figure out how much to sell spots for. There are a couple of ways to go about this. You could just do a flat rate for every spot. Or you could charge more for different locations in the show. For instance, if you have a strong program in front of your show, one :30 spot right up top could cost more since they will be getting viewers who have stayed from the previous program. For the purpose of this post, let’s say they are all priced the same. That’s not much. And not a lot of wiggle room if a sponsor drops out. But you could get things off the ground with this. The goal isn’t to generate enough revenue from one market, but to get lots of markets bringing in revenue so you can afford to make more programs. Replicate this in 10 markets and you’ve got $800 per week. $41,600 annually. 20 markets is $83,200. There are hundreds of markets in America. Every one will be different, and will be very hard to expand into any of them. Finally, sell the spots and buy the time. Gather the spots, embed in the shows and deliver them to the stations. Make no mistake, this is a huge amount of work. And you’re not bringing in the kind of revenue that allows a big staff. And while you are managing all this, you need to be creating more content. If it was easy, everyone would do it. How can you make this work better? Reduce costs. Can you get the airtime for less per week? In the smaller example, at $300 for airtime you’re bringing in $180. That’s $2340 for a 13 week run. $9360 annually. From one market. But this is a balance. The better the time, the more expensive the time. Your buyer needs to be aggressive. Can you charge more for ads? Your media buyers should be able to tell you what ads in your time slot would go for. Christian who are business owners may be willing to give a little more to support the kind of programming you are creating. $60 per spot? $75? With a discount for multiple spots in a program? I once paid $3500 for a :30 spot in the bottom half of the hour during a season finale on a major network. If you have the audience, people will buy the spots for more. Work out a trade with a station. They give you the time, you provide the audience, and you split the ads spots. In the smaller market, you’d be looking at $300 per week in revenue. This becomes tricky with the media buyers, because you still need to pay for their services for that market. They will want, and you should be willing to pay for, their cut for buying the time. You should still clear more revenue per market, per week. But you need to show the station that you have an audience in their market. Selling spots. You have to keep the spots sold, or you will sink. That’s it. Placement. You have to have the program in the best time slot. Cheap enough to allow you to sell spots. Good enough that people will watch your show. 3:00 AM will be cheap, but no one will watch. Without viewers, it’s a waste. Why not use a network? The key, at least initially, is local advertisers. It’s definitely possible to go to a cable network and buy time regionally and nationally, but it’s a lot of money. (Even Christian networks can charge $5000 for a 30-minute slot.) You’ve got potential advertisers on the local level. But, they won’t pay to advertise their business where they don’t sell products. Until you can prove your show can draw a good audience, the regional and national sponsors aren’t going to be an option. You might have dreams of going to an Interstate Batteries or Chic Fil A for sponsorship, but they are going to want some ratings and proof of audience before they spend any money. So start local. Why bother with traditional broadcasting? 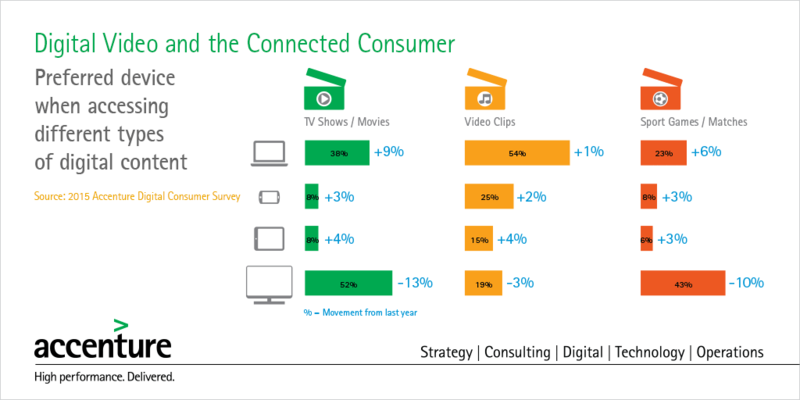 We know that online viewing and streaming is on the rise. TV viewing is declining. But it’s not dead yet. People still watch 140+ hours of TV per month. How to generate revenue online is a huge topic, and we should be working toward a sustainable model there as well. But in the meantime there is still an audience for your program watching traditional broadcasts. Based on a true story. Details have been changed and names withheld. Stories like this are too common. Once upon a time there was a large church which had 2 staff members who, in addition to other duties, created videos for the ministry. The two staff members were overworked. They had completed over 40 video projects from start to finish in the last year, in addition to keeping the live video for services and events functioning, and other odds and ends projects. These two staff members almost always did all pre production, production and post themselves, without any help. None of the 40+ projects had any budget beyond a few hundred dollars in a catch-all line item of the organization’s budget. Some of these 40+ videos were simple talking-heads, while others were much more complicated. The lead time on these videos ranged from as much as 2 weeks to as little as 24 hours. As you might guess, some of the videos weren’t as high quality as they might have been, and a few leaders on the staff wondered why that was. The two video staff members never sat down with their supervisors and explained what it would take to have high quality videos produced at a pace that was sustainable. One day the leaders of the church were in meeting talking about an important video project. They decided that they couldn’t risk this video looking bad. It must look great, communicate well, and be professionally done. So they decided to outsource the video project to “professional” videographers. The leaders did not reach out to their overworked staff to handle this project, but instead took it upon themselves to hire a team to execute this production. They asked the most vocal critic of the video quality of the church, a photographer, to produce this project. He hired some amazing talent to help; there was one of the best cinematographers in the area, a top notch editor, an ex news reporter to help with interviews, and of course the photographer would take pictures as well as produce the project. For this important project they were given a 6 week lead time. The professionals groused and grumbled about the lack of time to do their best work, but agreed to give it a try. The church leaders never asked to see a quote. During the 6 week timeframe, the professional video team accidentally ruffled feathers and caused misunderstandings because they didn’t know the normal procedures of the church. The two video staff members were sometimes asked detailed questions about the video project, even by the same church leaders who decided to bypass them, but they we unable to answer. Much of the church leadership was in the dark about the project until it was revealed. The weekend finally came when the video was to be unveiled. A video staff member received a download link with a message that music used in the video could not be broadcast or streamed on the internet. The message was delivered just hours before the video was supposed to be used in the service which was streamed and broadcast. They reported this to their supervisor, who told them to try to get the rights, and if they couldn’t, then ask the editor to replace the music. The professional editor didn’t have a grasp on how the end product was supposed to be used. The video staff spent Saturday afternoon negotiating with the publisher of the song, and came to an agreement on licensing. The cost for this license for one song from an unknown, indie-musician was almost $1000. Church leadership had just received the first inkling of what this video was going to cost. The video itself was a 7-minute masterpiece. Beautifully shot. Brilliant story interwoven with highlights and interviews. It was very well done. Everyone was pleased. The final bill came back at about 1/2 the annual salary of one of the staff video guys. For one project. As the invoices came in church leaders were aghast. They certainly expected to pay more than they ever had for any video project before. But for the bill to total in the tens of thousands? What were they paying for? The supervisor of the staff video producers asked if these numbers were normal. With the exception of the photo/producer’s invoice which was inflated and the “interviewer’s” invoice which was absurd, the rest was not only normal, but the charges were less than they should have been for the time required. The rental was reasonable, and the day rates obviously discounted. Most members of the professional team were trying to give the church a break, but the church leaders had no idea what it costs to do video projects of this caliber. The staff members who had been responsible for the video work had not educated the leaders who assigned the work. instead, they just did what they were told as best as they could. In the end, invoices were paid (Though some were negotiated lower) and for a time church leaders had a better understanding of what it costs do produce amazing video content. But they didn’t increase the budget for any of their other projects, and within a few weeks the time lines for projects were as short as ever before. A few months later, the 2 staff members no longer worked for the organization. If you want high quality video it costs. It costs time and money. The quality triangle applies. 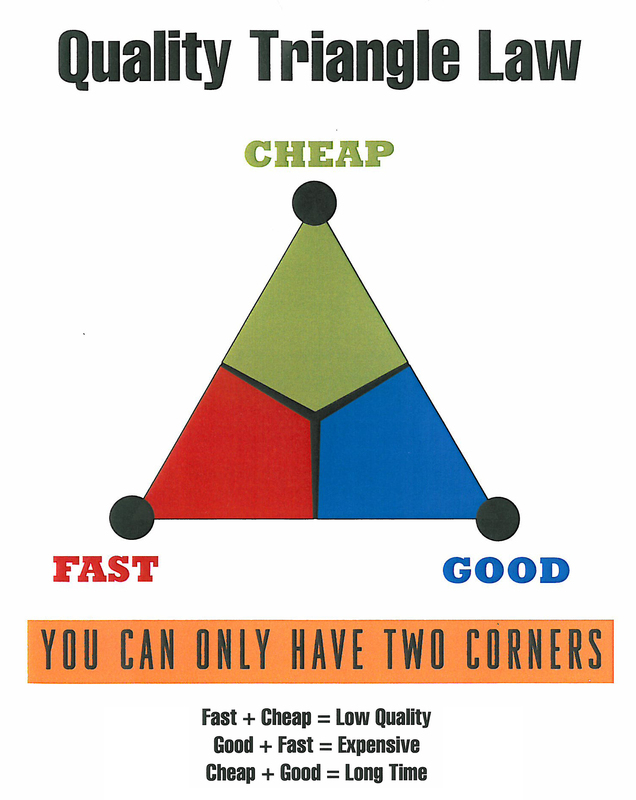 Good, fast, cheap: Pick two, you can’t have the third. You get what you pay for. The producers on staff should have talked to leadership about how the truncated timelines with no extra budget were impacting the quality of their projects. And church leadership should have listened. How many churches throw so much work on a tech that he cannot execute most of his duties with excellence, and then become frustrated with lower quality results… and begin looking for a replacement? How many techs are afraid to speak to their bosses about unrealistic expectations because they fear being fired or worse, sidelined? Techs, save yourself the headaches of stories like this one. Talk to your team, your staff leadership. Let them know what your workload is, and how it affects your performance. Learn how to speak and explain in a way that they can understand. Ask for help if you need it. Church leaders want amazing ministry. We’re in this together. If something they are doing is impacting quality, they want to know. A lot of leadership (anywhere, not just churches) is allocating time and resources based on circumstances. Your boss can’t lead you if you won’t give him critical information about how you can best do your work, and deliver excellence.